AN al-Qaeda terrorist involved in a plot to bomb London was taught how to be a stand-up COMIC at his top-security prison, The Sun can reveal. Evil Zia Ul Haq was enrolled on an eight-day “comedy workshop” at Whitemoor jail, along with murderers and rapists. An inquiry was launched today by the director of high security prisons to consider whether further action was needed, the Ministry of Justice said. A spokeswoman added: “The director general of the National Offender Management Service is personally briefing governors from all prisons on the need to take account of the public acceptability test in relation to prison classes.” Once they “graduated” they were due to get a certificate and display their new talents with a comedy show for fellow lags and guards. Last night Justice Secretary Jack Straw canned the “totally unacceptable” course after The Sun alerted him. He also vetoed a plan by the Category A Cambridgeshire prison to set up its own comedy club. A month ago … I recorded the dismay spreading through the UK Prison Service as a result of Jack Straw’s banning of a well-established comedy course at Whitemoor Prison. Some nasty little toe-rag outed it to indignant tabloids looking for something to get cross about. That second message is about work: co-operation, learning, taking direction and how it takes the sweated patience of theatre to create, in a live moment, a magical emotional unity between audience and performers. We were, of course, all expecting the barnstorming “Officer Krupke” to be rich in dramatic irony (“Gee, Officer Krupke, we’re very upset; We never had the love that ev’ry child oughta get. We ain’t no delinquents, We’re misunderstood. Deep down inside us there is good!”) and so it proved, especially when the last verse was sung extra-lustily to the prison project’s patron, former cabinet minister Michael Portillo, smiling sheepishly in the stalls. [L]ike Libby Purves, I was at the opening night of this amazing show last Friday … Those of us who work as volunteers (monitoring day-to-day conditions and events in prisoners’ lives in HMP Wandsworth), know … about the inestimable value of drama and the other arts in prisons … And [Libby Purves is] absolutely right too about the quality of the production — the audience wouldn’t stop applauding at times — and what it must be doing for the prisoners taking part. I didn’t know whether to laugh or cry much of the time — so, like many other people, I did both. Just imagine prisoners singing: Gee Officer Krupke….We never had the love every child oughta get…We ain’t no delinquents, we’re misunderstood.. Deep down inside us there is good…! And: He don’t need a judge he needs an analyst’s care…It’s just his neurosis that oughta be curbed… He’s psychologic’ly disturbed…! And so on. Hilarious stuff. But I wondered about the men singing it. Did they sense the irony? What did they feel? Learn? I’ll try to find out from some of them in the near future when reality re-imposes itself. Jack Straw’s ignorant, cowardly fiat, surrendering instantly to The Sun’s bullying, very nearly caused the abandonment of this hugely worth-while project. He didn’t, you’ll notice, attempt to defend the ban on ‘inappropriate’ courses such as training in comedian’s skills in prisons, nor to deny their potential value as rehabilitation tools, boosters of morale and self-respect, bonding and community spirit. His sole concern is whether any activity is publicly “acceptable” — acceptability, it seems, defined not by what is acceptable to Lord Ramsbotham or to others who understand that the punishment of being sent to prison is the withdrawal of liberty, not ill-treatment and mindless deprivations while behind bars: acceptability defined purely, or impurely, by what is acceptable to The Sun newspaper. How low can a minister entrusted with ‘justice’ sink? But what should we expect of Mr Straw, Justice Secretary — indeed also Lord Chancellor in his spare time? He was the Foreign Secretary at the time of the Blair government’s illegal attack on Iraq, the senior minister whose own department’s legal advisers had warned him in writing that an attack on Iraq would constitute the crime of aggression, but who apparently had not had the courage to relay that warning to his Cabinet colleagues (we would have heard about it by now if he had) nor to resign when it was brushed impatiently aside by Mr Blair. He was the home secretary who, as recorded by Wikipedia, “brought forward the Regulation of Investigatory Powers Act 2000, increased police powers against terrorism and proposed a reduction in the right to trial by jury. These policies won praise from Margaret Thatcher who once declared ‘I trust Jack Straw. He is a very fair man.’ They were deemed excessively authoritarian by his former students’ union, which in 2000 banned him from the building…” He was was responsible for allowing General Augusto Pinochet to return to Chile. 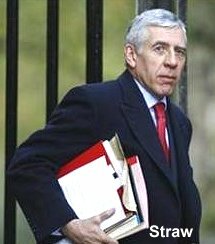 In 2000 he turned down an asylum request from a man fleeing Saddam Hussein’s regime, saying “we have faith in the integrity of the Iraqi judicial process and that you should have no concerns if you haven’t done anything wrong.” Only Gordon Brown, Alastair Darling and Jack Straw have served continuously in every Labour cabinet since Labour’s triumph in 1997. We have accumulated ample evidence by now of what kind of politician the Justice Secretary is. Nothing that he does should surprise us. Truly disgusting. I was speculating in a lecture this morning about whether the punitive moralism of Blair’s New Labour might be on the wane under Brown. Perhaps we shouldn’t get our hopes up while the likes of Straw are still hanging on. ‘Dear Comrade Editor: In his report on President Arafat’s funeral ceremony in Cairo (13 November), Robert Fisk uttered such a malicious libel against me that I am certain that even the late George Carman QC would have taken my case without fee. We, especially those who were at Cambridge, also remember another Stalinist thug called Charles Clarke, who led SocSoc and the Cambridge Students Union (not the Union Society). We also seem to remember that Clarke spent some time in Cuba helping Castro gather in his sugar and learning how to create and run a Socialist paradise — but as Clarke’s Wikipedia entry makes no mention of this, our memories are obviously at fault and in need of reeducation. Thanks for drawing our attention to this latest ministerial act of cowardice. It exemplifies why I expressed my doubts, in a comment last week, as to whether those politicians who currently denounce the surveillance state would sing the same tune if they ever found themselves in office. A post-script to the Pimlico/West Side Story saga: last Wednesday Kevin Wood, the prisoner whom everyone who saw the show singled out as being particularly special, was released from court, a free man. Wasfi Kani‘s letter, amounting to an offer of a contract for the Grange Park summer season, was read out. A number of the West Side Story cast had gone along to court to support Kevin. (Well, not the prisoners, obviously.) As the Judge released Kevin, he added: “And Mr Wood, may I take this opportunity to congratulate you on your review in the Financial Times?”. Kevin now has a contract for 3 shows at Grange Park and another company has offered him a job in the West End later in the year. You couldn’t make it up, or rather, you wouldn’t — it’s too much of a fairy story. Please could everyone cross everything that this man makes a safe transition into his new life?